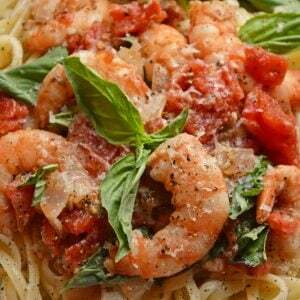 Tomato Basil Shrimp Pasta is a deliciously easy and healthy shrimp pasta recipe. It's full of flavor but quick and simple to make! Heat olive oil in a large, wide skillet over medium heat. Add onion and saute for 2-3 minutes, until starting to soften. Add garlic and whole fennel seeds, sauteing for an additional 2 minutes. Add shrimp and salt, cooking for 2-3 minutes. Allow shrimp to start turning pink and curling. Add drained tomatoes, heating until shrimp are fully cooked, approximately 2-3 additional minutes. Lastly, stir in hand torn basil and serve immediately.